Internet Monitor is delighted to announce the pilot launch of its new website, thenetmonitor.org. This new platform compiles, curates, and presents data on Internet access and controls from both the Berkman Center and a number of partners and other sources. This first version of the Internet Monitor platform contains Internet filtering data from the OpenNet Initiative, broadband data from Akamai, speed and quality data from NetIndex, crowdsourced web blockage data from Herdict, broadband pricing data from Google and Communications Chambers, and more. Internet Monitor continues to seek and integrate new sources of data in order to provide policy makers, digital activists, researchers, and user communities with an authoritative, independent, and multi-faceted set of quantitative data on the state of the global Internet; as part of our second phase of development, we’ll be incorporating both additional data and new functionality. The platform also brings together 15 indicators on Internet access and infrastructure to create the Internet Monitor Access Index. This user-configurable index captures Internet access from several angles, including measures of Internet adoption, speed, price, and proxies for the ability of citizens to productively engage in online activity if given the opportunity: gender equality and education. Each of these four categories looks at the question of access from different but interrelated perspectives. The site also provides easy access to Internet Monitor research publications, including our special report series and our annual report, which highlights some of the most fascinating developments and debates in the digitally networked environment each year. Our blog provides regular updates on key news and events related to Internet control and online activity around the world. We welcome feedback on the site—including suggestions for additional data sources, bug reports, and any other thoughts you may have. Please reach out to info at thenetmonitor.org with your comments. 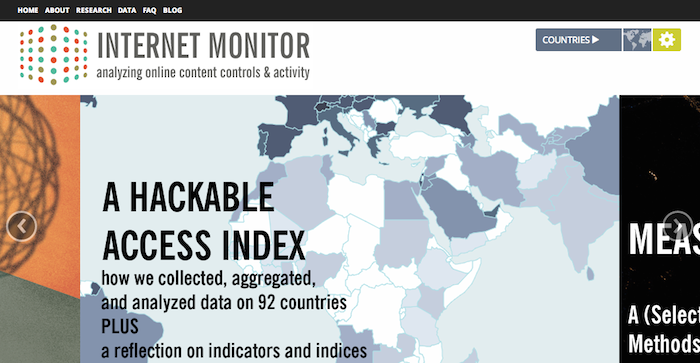 Internet Monitor, based at the Berkman Center for Internet & Society, is a research project to evaluate, describe, and summarize the means, mechanisms, and extent of Internet content controls and Internet activity around the world. The project compiles and curates data from multiple sources, including primary data collected by the Berkman Center and our partners, as well as relevant secondary data. The Internet Monitor platform is a freely available online fact base that gives policy makers, digital activists, researchers, and user communities an authoritative, independent, and multi-faceted set of quantitative data on the state of the global Internet. Internet Monitor also provides expert analysis on the state of the global Internet via our special report series and our annual reports on notable events and trends in the digital space. It has been over a month since Thailand’s military junta, the National Council for Peace and Order (NCPO), overtook the country’s government during a May 22 coup. Since then, the NCPO has aimed to consolidate political control of the country, an impulse that has filtered down to controlling nearly every minute facet of citizens’ public and private life. Citizens in Thailand can’t gesture with Hunger Games-like salutes, nor can they read such texts as Orwell’s 1984 and Filipino revolutionary Jose Rizel’s Noli Me Tangere in public spaces. Those acts, the junta claims, are expressions of radicalism. 2014 Thai Coup, via Wikimedia Commons. The NCPO has increasingly moved this strategic policing online. They have ordered Thai ISPs to shut down over 200 sites. Some casualties of this call for censorship include Prachatai, an independent online newspaper; the Asia and Thailand subpages of the Human Rights Watch, which published an incriminating report detailing the country’s 2010 Red Shirt protests; and Facebook, which was blocked for a day on May 28 before the NCPO swiftly unblocked it, citing a “glitch” that activists have chalked up to a social media “kill switch.” When the government tried to set up a meeting with Facebook and Twitter to discuss tactics for censoring anti-junta impulses on social media, the companies in question didn’t show. Access Now recently reported that the junta is now organizing governmental panels that will surveil all facets of national media, extending to online media platforms. The junta is offering monetary incentive to those citizens who turn in photos, videos, or other incriminating evidence of people criticizing the junta. Lisa Gardner of PBS MediaShift attributes this censorship to the junta’s desire to foster a sense of allegiance towards its regime. For many citizens, the Internet is largely losing its function as a forum through which netizens can access information, share opinions, and fight against the climate of fear engendered by the junta, whom Gardner claims is trying, in earnest, to convince Thailand’s citizenry of its good intentions. 2010 Red Shirt Protests, via Wikimedia Commons. Writing in Global Voices Bridge, an anonymous Thai journalist described firsthand the current situation as one in which citizens can “feel total censorship in the air.” The journalist notes that Thailand’s history of military takeovers, such as 2010’s aforementioned Red Shirt protests, saw a similar shutdown of media outlets. This created a political climate in which lack of informational access, coupled with an online media milieu that is curated excessively by Thailand’s junta, led to citizen compliance with human rights atrocities – a risk the anonymous journalist feels may be presented by the NCPO’s current hold over online communication outlets. A potentially invasive surveillance bill due to be introduced to Australia’s parliament in July is inspiring resistance within the country. The bill aims to target potential jihadists and other terrorists who may be spreading violent rhetoric in their online networks. Prime Minister Tony Abbott claimed that jihadists who have been radicalized by their experiences with al-Qaeda and its offshoots may threaten national security, spreading their hateful rhetoric online. As such, this bill would give the Australian government power to store public metadata. In a climate of political uncertainty, the Egyptian government has sought to extend its hold over its citizenry by creating a media monitoring software that will understand multiple forms of written Arabic. The system, built to read both colloquial and Romanized Arabic, would allow the government to access the digital footprints of various citizens who may be harboring oppositional thoughts online. Human Rights Watch’ Cynthia Wong warns that such a move would restrict Egyptian’s netizens from expressing themselves fully and totally online, noting that the Internet has played a significant role in empowering independent voices of reform in Egypt. As the reality of stifled internet connectivity intensifies in Iraq, netizens are finding cunning ways around these blockages. FireChat, a smartphone app that doesn’t require an internet connection, has seen an unprecedented surge in downloads and consumption since June 14. Iraq, Bloomberg reports, ranks just behind the United States in terms of daily smartphone usage, making FireChat a widely-used form of communication in the country. A Citizen Lab report released earlier this month also concluded that ISIS filters placed upon websites in Iraq have been largely ineffective, while the use of Psiphon and Tor has increased significantly in the wake of the internet shutdown. This week, Russia’s Interior Ministry drafted a ten-year strategy to fight extremism – a strategy that could lead to online surveillance of netizens. Extremism is broadly defined under Russian federal law, ranging from hate crimes to armed revolution. The strategy aims to counter politically radical movements from the bottom up, targeting information sources and netizens spreading extremist rhetoric online. News of this plan emerges during a week when Colin Cromwell, Twitter’s head of global public policy, visited Russia and agreed to block “extremist accounts” under the demands of Russia’s Alexander Zharov, the chief of Russian federal communications agency Roskomnadzor. Since last month’s coup, Thailand’s junta has increasingly clamped down on pro-democracy movements online. For weeks, the “liking” of Facebook pages dedicated to anti-coup groups has been outlawed, while numerous pro-democracy websites have been blocked. IFEX reported that the junta is now deceiving netizens into unveiling their personal details through a deceptive Facebook phishing app, through which users are encouraged to “log in” with their personal information that is stored in their Facebook profiles. This faulty, fake app is in violation of Facebook’s own policies, and it was suspended twice by Facebook as a result. Access also reports that the junta has recently set up five media monitoring panels that intend to surveil social media for any dissenting opinions. #imweekly is a weekly round-up of news about Internet content controls and activity around the world. To subscribe via RSS, click here. Laal is one of Pakistan’s most popular bands. To the ire of the Pakistani government, it’s known for being vocally, unapologetically secular—so much that the Pakistan Telecommunications Authority (PTA), the country’s governing board for telecommunications, decided to block access to its Facebook page earlier this month. After invoking protest and anger from many netizens, the government lifted the block on Laal’s page. Similar controversy arose last month arose when the PTA asked Twitter to block access to a number of tweets they cast as unethical and obscene. To the PTA, these tweets defied the country’s blasphemy laws. These ranged from individual tweets, such as ones containing visualizations of Muhammad, to whole Twitter feeds, like that of Duke University pornstar Belle Knox (Knox herself spoke out against the blocks). Twitter complied with these requests. The company, which reviews censorship requests on a country-by-country basis, justified the blocks by claiming it was more acceptable to block specific tweets than it was to block access to the site as a whole. This past week, after encountering civic resistance at home and abroad, Twitter decided to restore access to the tweets within the country. Laal performing in Karachi in 2011; via Wikimedia Commons. Both cases recall a debate that has frightened media activists in Pakistan in the wake of the Snowden revelations. How do Pakistan’s blasphemy laws, which date back as far as the 1860s, extend to the Internet? To what extent are these laws, steeped in Pakistan’s history, being used to justify censorship? The answers to these questions have escaped Pakistani netizens for years now. Pakistan’s Penal Code defines blasphemy in broad terms, and the laws have gone through many iterations dating as far back as the 1860s. For decades, though, civic opposition to the laws has remained strong, especially beginning in the 1980s. As Pakistan’s citizens have moved online, these blasphemy laws have been used as justification for restricting access to tweets, Facebook posts, and YouTube videos. They’ve also been used to justify arrests, assassination attempts, and murders. The initial decisions to block social media content ignited furor and criticism from civic groups both within and outside of Pakistan. Press freedom NGO Bolo Bhi questioned the legitimacy of giving the PTA power to call for restrictions of content. Activists both within and outside of Pakistan launched a hashtag campaign, #TwitterTheocracy, to mobilize against this censorship. Some netizens criticized Twitter for abandoning its fundamental ethos of protecting free speech, while others, like Richard Dawkins, found it curious that Twitter would side with the country’s age-old blasphemy laws. The campaign worked. In a statement reposted on Chilling Effects, Twitter explained that a re-examination of requests prompted the restoration of access on June 17. To media freedom activists at home and abroad, Twitter’s explanation wasn’t enough. The decision to reverse the restrictions has been hailed, by Bolo Bhi, as something of a minor victory—minor if only because of the ambiguous terms under which Twitter blocked access to the content in the first place. Media practitioners within Pakistan fear that restrictions of this kind may be due to a new cultural stigma engendered by the Snowden revelations. Snowden’s leaks have led many Pakistani conservatives to cast freedom of expression as a sort of undesirable, neo-colonialist Western conceit. In a letter published by the Committee to Protect Journalists, Sana Saleem of Bolo Bhi explained the damning effects Snowden’s revelations have had on netizens in Pakistan, where the government is trying in earnest to replicate NSA’s model of censorship and surveillance. Pakistan’s government has drafted provisions for an allegedly draconian Cybercrime Law, while the country’s Supreme Court has suggested merging the PTA with Pakistan’s Electronic Media Regulatory Authority (PEMRA), meaning that social media now be understood as broadcast media. This would subject social media to the same monitoring restrictions as those governing broadcast media. This is the precise justification the PTA used in 2012 when it blocked YouTube, after the controversially Islamophobic Innocence of Muslims made its way onto the sharing site. To activists and media freedom advocates like Saleem, the Snowden revelations have had the opposite desired effect upon freedom of expression in Pakistan. The state and its actors are now more inclined to monitor what its citizens do online, particularly on social media outlets headquartered in the Western world. If Twitter is the least of many evils—some activists point out that Facebook and YouTube regularly comply with more pervasive government censorship calls – its country-by-country censorship process is still cause for alarm for many of Pakistan’s media freedom activists. There’s a prison, hidden in the suburbs of Addis Ababa, named Kality. Home to many of Ethiopia’s political prisoners, the prison is divided into eight zones. The last of these zones, Zone Eight, is home to detained journalists, human rights activists, and dissidents. Free Zone 9 bloggers campaign image. Created by Hugh D’Andrade, remixed by Hisham Almiraat; via Global Voices Advocacy. To some Ethiopian netizens, there is a Ninth Zone – a Zone dedicated to the “proverbial prison in which all Ethiopians live”. In 2012, a group of passionate Ethiopian bloggers launched Zone Nine, a blogging collective that, in its own words, “blogs because it cares”. Zone Nine prides itself on providing a counter to the opinions, voices, and attitudes that dominate Ethiopia’s press. The six arrested Zone Nine bloggers; via Global Voices Advocacy. In April 2014, six of Zone Nine’s bloggers – along with three print journalists suspected of associating with the group – were arrested on the grounds that they were covertly receiving money from foreign human rights organizations to incite violence through social media. 63 days have passed since their detention. The bloggers have appeared in court continually over the past few months while being detained in Addis Ababa’s Maekelawi detention center. No formal charges have been leveled against them as of yet. That said, activists fear that these bloggers and journalists will suffer the same fate that befell Eskinder Nega and Reeyot Alemu, two journalists imprisoned and charged with terrorism (a crime that carries heavy fines and a lengthy prison term) in 2011. The collective has blogged about numerous political issues affecting the Ethiopian populace, hoping to bolster civic discourse in service of social change. In the wake of Prime Minister Meles Zenawi’s death, for example, Zone Nine penned scathing critiques of Zenawi’s proclaimed economic development achievements, casting doubt on his legacies. They also partnered with Global Voices to launch Global Voices in Amharic in 2012, hoping to make international news accessible to local readers. Since its inception, Zone Nine has amassed a passionate readership within the country. 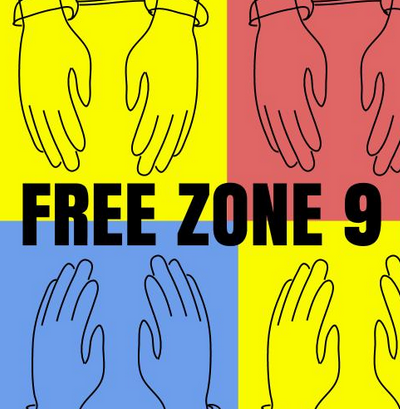 According to its own bloggers, Zone Nine’s stories have occasionally been picked up by wider-known publications within the country, signaling wider support for the messages it has broadcasted. Outside of Ethiopia, the detention of the Zone Nine bloggers has ignited public furor. Global Voices launched a #FreeZone9Bloggers hashtagging campaign and organized a FreeZone9Bloggers Tweetathon on May 14, while UN High Commissioner Navi Pillay criticized Ethiopia’s increasing frequency of charges against journalists on the grounds of terrorism. Slowly losing track of # of days #Zone9Bloggers jailed, but not losing track of them. 1 is a numerical issue, the other is a human issue. The arrests arrive in the context of what some activists fear is a growingly repressive media milieu in Ethiopia. For years, journalists – on and offline – have been susceptible to governmental terrorism charges. The Committee to Protect Journalists has claimed that more journalists have fled Ethiopia since May 2013 than in anywhere else in the world. An ambiguously-worded anti-terrorism law, mobilized in 2009, gave the Ethiopian government the power to act against any form of political dissent so long as it is deemed “supportive of armed opposition activity”. The passage of this law has led to the arrest and detention of scores of journalists. Recently, this fight against journalists has moved online, with Ethiopian governmental officials moving to counteract online criticism of their efforts by training blogging recruits to attack any online criticism of the administration (a practice known as astroturfing). The government has trained over 230 bloggers since May, teaching them how to post comments that sing the praises of the regime on social media—a particularly interesting move, given that less than 2% of Ethiopia’s population has Internet access.